My Chuck Taylors have seen better days. They’ve pounded cobblestones in Dublin, concrete in Brooklyn and dusty blacktop in Fiji. Not to mention dance floors across Canada and Europe. They look tired and yet I still get compliments on them at the oddest times, like at human rights rallies in Vancouver, a laundromat in Amsterdam’s red-light district and high-end designer boutiques in New York’s Upper East Side. In fact, the older and more beat up they get the more compliments they seem to receive. And, I’ve never met anyone else wearing them. How can that be in a world awash in cheaply made Converse sneakers from China? I picked up these low Converses a decade ago with my friend Alicia on Toronto’s Yonge Street, once fittingly considered the longest street in the world. An athletic store was having a sale: buy two and get the second pair for half price. I settled on the loudest pair they had – a shiny, satiny purple covered in delicate chinoiserie inspired flowers. Lish found a pair of chambray coloured hightops. We split the difference in the bill. I don’t know how often Lish has worn her sneakers, or if she even still has them. But my Chucks, well, they’ve seen a lot of action. I think I settled on them that day in the store because they reminded me of a pair of the ugliest sneakers I’ve ever seen. My friend Brenda had a pair of knockoff hightops in bright orange satin. She wore them when we won a lip-synching contest singing Elvis’s Blue Suede Shoes in Grade 6. I know . . . we covered them in blue construction paper slippers but they kept slipping off anyway. I guess the judges overlooked the colour discrepancy. 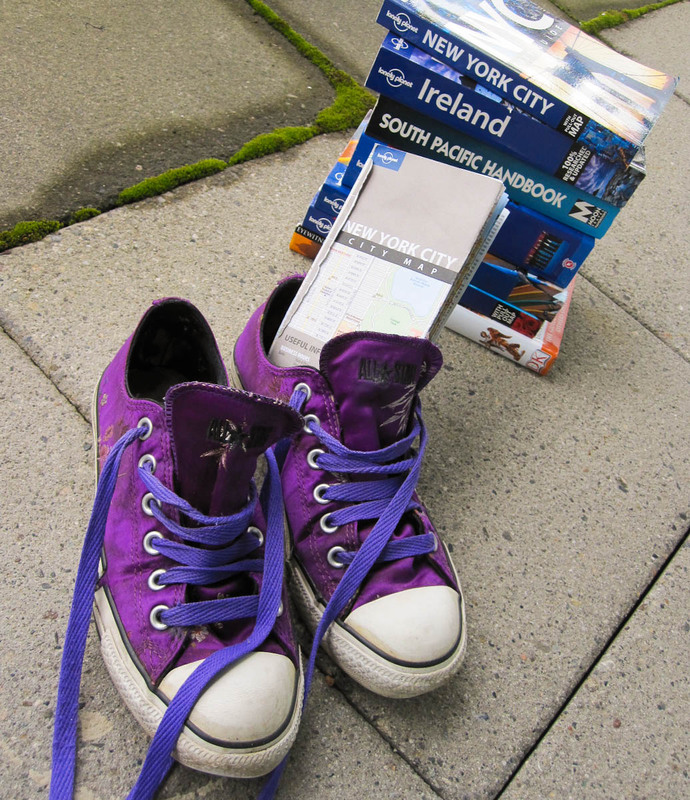 Chucks are a great option when travelling. They’re light and they tend to look better the grungier they get. They also have an undeniable cool factor. No one thinks proper athletic shoes for walking long distances are cool. Never. They also have no support, leak when it rains or even approach a puddle, and tend to pinch me on my baby toes and rub my heels dangerously close to blisters if I’m not wearing the right type of socks. So, in a word, they’re perfect. I haven’t always been faithful to them while travelling. I didn’t dare wear them while scaling the spiny, jagged tips of the a’a (ah ah) lava in Hawaii Volcanoes National Park. (I destroyed a pair of old Reeboks doing that). I also didn’t wear them on the Appian Way or on the chariot-rutted streets of Pompeii – sometimes comfort does win over looks. I preferred Birkenstocks for a while but their tough leather always cuts into my big toes. I also have a terrible habit of catching the lip of them on sidewalks and pitching into crowds. Over the years, I kept thinking I would grow out of my Chucks before they would fall apart on me. I mean, how long can a person wear purple sneakers? But somehow I always seem to reach for them in the closet. The only other shoes that have come close recently are a pair of worn-in John Fluevog saddle brown BBC boots. The unusually harsh Irish winter in 2011 wore their soles down dangerously close to nothing. Last year, one of the Chuck’s laces finally snapped on me when I bent down to tie them on Dublin’s Grafton Street. Amazingly, I found the perfect purple replacement laces, Mr. Lacey, in a nearby skate shop just off the main drag. Now, they are once again making alarming noises when I pull them tight. Finding those laces last year was a fluke. Will I ever be that lucky in laces again? In Vancouver, I’ve seen vintage used Chucks for sale on Commercial Drive and it made me sad. Sure, they’re all broken down with their tongues hanging out and their laces crimped but who could have parted with such a personal item? Such a badge of personal identity? Did they grow up, move away or develop complicated foot problems? By far the best experience I had with my purple Chucks came in that high-end designer boutique in the Carnegie Hill area of New York. In the small store window that I walked past occasionally while coming home from work in Midtown was a beautiful strapless dress with a tiny bustle in a mishmash of textures and prints in the most brilliant azure blues and acidy yellows. It was on sale. Why, thank you Silvio. I really really wish I could have afforded it!